Okay, I know what you’re thinking, I’m being a showoff. But I promise I’m not. In fact, the Rolex Submariner is the only really nice watch that I own. I couldn’t leave this off of things men buy because like many other men, I like watches! 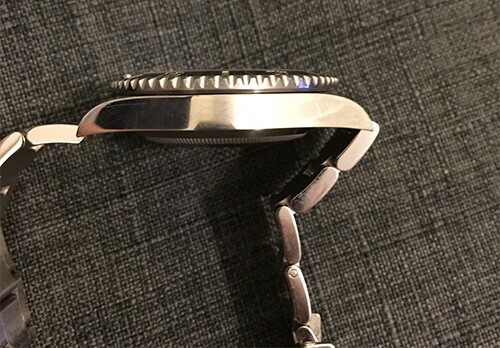 I’ve got a pretty good story behind the watch so I figured I’d write a review and share my story. I posted this under big boy toys because I personally wasn’t able to buy one of these until I was financially stable enough to do so. Plus, I didn’t want to put it under technology since it’s not really very high tech, although very well made. So, just like Tim and other Internet marketers that I run with, I’ve worked extremely hard to build up traffic, business and earnings over the last few years. In fact, I’ve spent a lot of time focusing on building and not worrying about the money so much. Thankfully, the hard work paid off and I wanted to treat myself. Since I was a watch collector at the time, I found myself owning 20+ watches and spending hundreds each year on batteries alone. It was a nice collection with watches ranging in value from $100 – $1,000 per much. With most watches costing in the mid $100’s range. One day I woke up and convinced myself that I earned the right to treat myself to something for all the hard work I’ve put in. I decided to kill two birds with one stone, buying a nice automatic watch would do the trick. I walked into a family owned jewelry store in downtime Miami, FL called Kirk Jewelers. I walked in and immediately connected with the Vice President of the company. Soon as I found out the owner went to school in Boston, I knew I wasn’t leaving empty handed. My fiance accompanied me and I asked her which Submariner she liked. The black dial caught my eye and at that point I knew that was the watch for me for years to come. I love this Rolex not because it’s expensive, not because it’s recognizable, but because it never fails me and it’s simple and clean looking. The watch isn’t so heavy that it’s annoying yet it has enough weight so that I never forget that it’s there. I really like how easy it is to keep the ceramic face clean. The watch is stainless steel and the comfort is really outstanding. The model that I purchased was the first year that they made the change in lugs, making them wider. I believe the size is 40mm. It’s like a modern simple work of art and given that I love simplicity, I couldn’t be happier. The watch says oyster perpetual on the face and it’s safe to wear in the water. I’ve never ever had a problem. Although, the only diving I’ve been doing lately is desk diving, which is why I have some scratches on the bottom of the clasp. Lastly, I purchased the No Date because it was more economical and I can’t for the life of me keep up with the date changing on short months. I just rather not deal with it, lol. All that being said, I’m really happy that I purchased this watch and I literally only wear this and my black Casio G-Shock these days. All other watches have been out of rotation since I purchased this one. Now if you’re looking to purchase a nice new watch, you don’t have to go this crazy and buy a $7,500 watch. There are plenty of other really nice watches out there for less. One thing I would suggest though is buying an automatic watch whatever decide to purchase. Batteries can get expensive as years go by. It all adds up and nothing is worse than not being able to tell time when you need to.